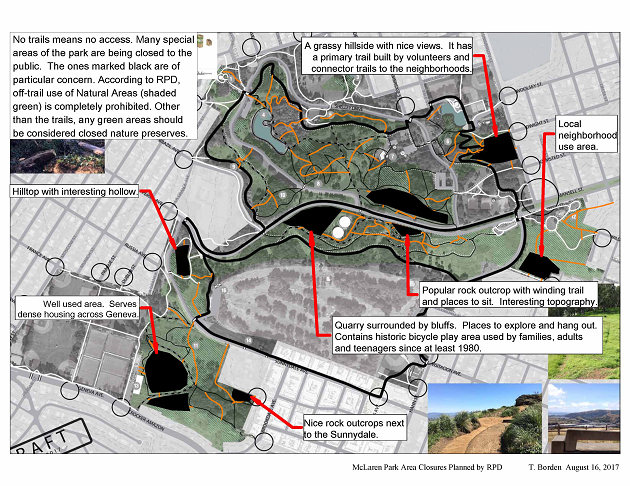 Plans are afoot in McLaren Park to close many of the trails people actually enjoy, and substitute a limited number of broad road-type paths. Most park users don’t realize this is going on – not just in McLaren, but all across the “Natural Areas.” SFFA supporter Tom Borden is trying to get the word out both to park users and to the decision influencers. He’s written to the San Francisco Recreation and Parks Commission, to Supervisors in affected supervisory districts, to the Parks and Recreation and Open Space Advisory Committee (PROSAC) and to the neighbors at McLaren Collaborative. We think it deserves wider attention: All across our parks, access restrictions are reducing the park space our families can actually use and enjoy. The Recreation and Parks Department has been hosting an “Envisioning Process” with the public to plan future improvements for McLaren Park and to decide which immediate needs should be addressed with funding from the 2012 Clean and Safe Neighborhood Parks Bond. RPD has focused the process on four areas, the amphitheater, the primary group picnic area, sport courts and trails & paths. The first three are moving along pretty well, but the trails & paths plan is headed in a direction that defies all public input. TRAILS RECONSTRUCTION ($4 million). 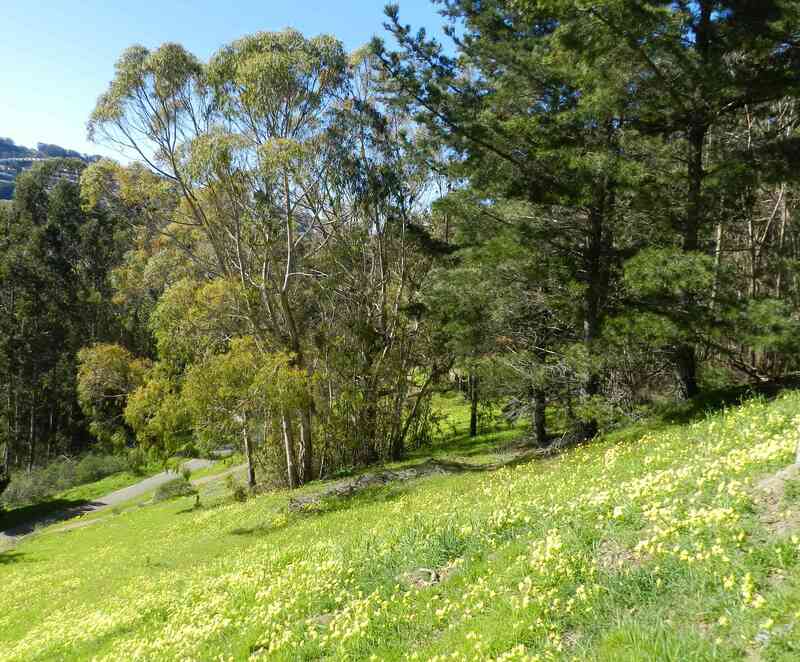 A portion of the proceeds of the proposed bond shall be used to repair and reconstruct park nature trails, pathways, and connectivity in Golden Gate Park and John McLaren Park. After identification and development of specific projects, environmental review required under CEQA will be completed. Since the bond passed, RPD has further earmarked the funds to direct $2M of the trails reconstruction money to McLaren. RPD has modified the bond language in their documentation to specify the money must be used, “to enhance existing trails and their surrounding landscape”. The clear intent of the of this unjustified new language is to allow money to be diverted from building and repairing trails to performing native plant habitat work. This is not what the public voted for. Further, RPD now says that $1.5M of the $10M must be spent “for projects that create or restore: Natural features, such as lakes, meadows, and landscapes & Habitat for the park’s many species of plants and animals.” That may be a choice RPD could make, but it is not a requirement of the bond ordinance. If we subtract out the acreage devoted to the Gleneagles golf course, well over half the park is wild land with a web of small trails that has evolved over decades. In the Envisioning Process, the public has been quite emphatic this trail network, combined with the wild landscape, is the most iconic element of the park and must be preserved. 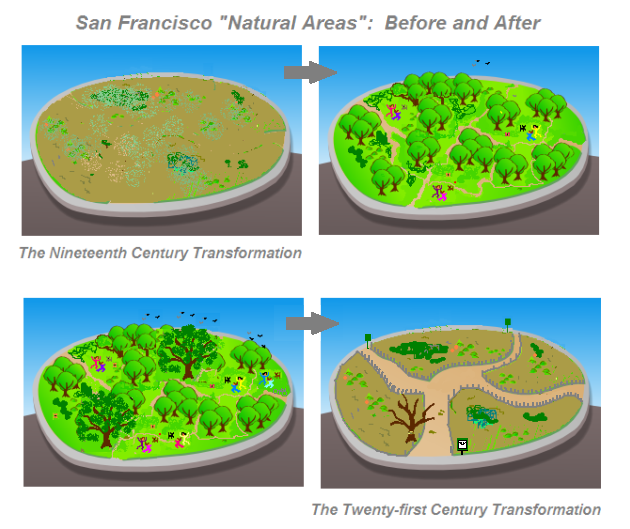 However, RPD has a completely different vision, driven by the desires of the Natural Areas Program (NAP). Under the cover of the Envisioning Process and using as much of the $12M as possible, they hope to turn the wild parkland into a nature preserve, accessible only to RPD staff and to supervised volunteer groups. To forward this goal, they plan to gut the interior of the park of 5.5 miles of trails (while adding less than 1.5 miles of new trail). This would roughly halve the length of trails in the park. Their plan focuses on developing primary paths that run around the outside perimeter of the park with the apparent intent of directing people away from the park interior. Some of the remaining interior trails would be substantially widened to carry the traffic displaced from the closed trails. In effect, the public are to be channelized on a few large trails. If that was not bad enough, RPD have stated their intent to restrict public access in wild areas of the park to on-trail only. We will not be allowed to explore, climb on rocks and experience nature up close. In effect, they want to close over half of the park to public access. Over the course of the Envisioning Process, RPD have refused to publish maps showing the existing trails that will be closed under their plan. The obvious intent of this is to avoid discussion of the trail closures. To help people understand what the RPD plan means, I have taken the RPD trail proposal presented at the last trail workshop and overlaid it with the existing trail alignments. These existing trails are ones shown on the current official park map and those that appear in the Significant Natural Resource Areas Management Plan(SNRAMP). A few other trails missed by these maps are also included. Only well used trails appear on the attached map. The other side of the coin is the area closures. RPD plans to completely remove trails from certain areas, meaning those areas will be closed to the public. On the second map [below] I’ve blacked out some of them and noted why they are special. Keep in mind, even where there are trails, if it’s a Natural Area, off-trail access is to be prohibited. The green shaded areas on the maps are Natural Areas. Leaving the golf course out of the calculation, well over half the park will be off limits. All we have left of our wild parkland is the shrinking network of trails running through RPD’s closed nature preserve. Does the Department have a mandate? RPD will say this is what the people want, that these trails closures and land closures are part of the SNRAMP. The SNRAMP EIR was certified by the Planning Commission, overcame an appeal at the BOS and was adopted by the Recreation and Park Commission. However, the currently proposed trail closures are much more extensive than what is presented in the SNRAMP. The intent to restrict the public to on-trail only in Natural Areas was not disclosed in the SNRAMP and not evaluated by its EIR. In the entire 711 page SNRAMP there is only one sentence that mentions the idea of restricting the public to trails and it is only in reference to MA2 areas. In the 1200+ page EIR there is no discussion of the impact of restricting the public to trails and closing everything else. RPD has not discussed the trail closures in the park. RPD has held no public hearings or had any other public process for the on-trail only restriction. There is no mandate for RPD’s current plans. 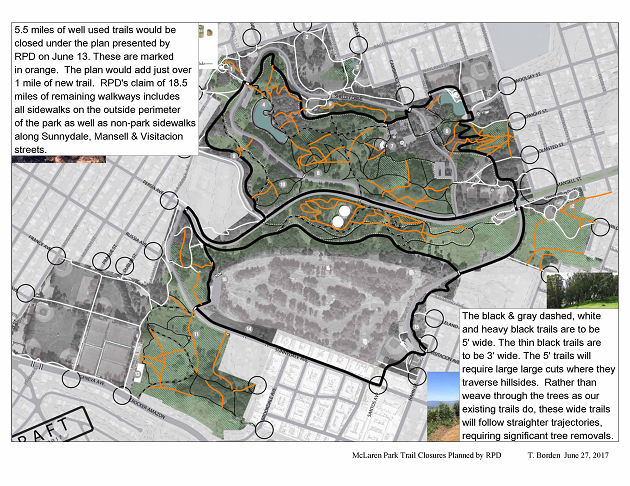 The 2012 McLaren Park Needs Assessment revealed exactly the same result, that more hiking and biking trails are the most desired park improvement. Why is RPD closing almost all of the trails to bike riders and dramatically shrinking the trail network? All of the trails in McLaren Park have been in use by pedestrians and cyclists for decades, sharing the trails without incident. RPD has no reports of user conflicts or accidents due to the mix of cyclists and pedestrians. The existing trails are well evolved to take people to the places they want to go. As a result, off trail excursions are dispersed and not frequent enough to lead to heavy trampling of plants. (Yes, things are different in the off leash dog area, but that does not apply to the park in general.) The surface area of the existing trails comprise less than 5% of the land area. The impact of park visitors on the viability native plants is trivial compared with the impacts of the changing local environment, global warming and the inevitable arrival and spread of plant species from outside the City. The planned trail closures and access restrictions run completely counter to the needs of the public. On top of this, the Department wants to siphon off money to fund their closure plan that could be spent on sorely needed park improvements, all of this with no demonstrated need to override the public good. – spend the bond money as the bond ordinance states and the voters intended. The trail money is for trails. The rest of the money is on the table for all purposes. The bond ordinance does not require the NAP receive $1.5M. Spend it where it will do the most good. –Repair and improve McLaren’s existing trails. 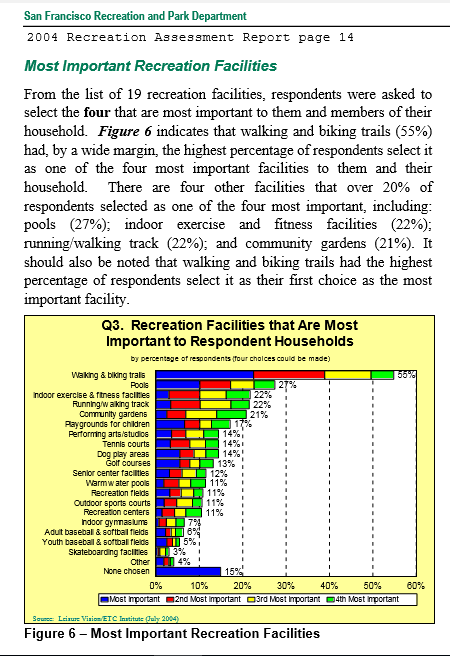 The public wants more and better trails, not fewer, wider, straighter, less engaging trails. –Conduct a transparent public process to work through any trail closures. Individually document the need for each trail closure, gather public input and act to serve the public. –Allow people to ride bikes on all park trails unless a need to restrict cycling is demonstrated. The San Francisco Forest Alliance opposes access restrictions from closing the trails made by park users and restricting access only to on-trail use of our parks. We need to keep all the trails that have been open since forever. When we were kids we had a time playing all through those trails. Fix are trails don’t take them away.